FILE - A Guatemalan father and son, who crossed the U.S.-Mexico border illegally, are apprehended by U.S. Border Patrol agents in San Diego, California, June 28, 2018. U.S. agents arrested nearly 17,000 members of family units attempting to cross the U.S. border with Mexico in September, a 31 percent increase over the previous month, according to official statistics released Tuesday. In a news briefing with reporters Tuesday, Trump administration officials pointed to the increase in migrant families as evidence of a "border crisis" because those groups are more difficult for immigration enforcement officials to detain and deport because of protections granted by U.S. law to migrant children. President Donald Trump's administration has expressed alarm at the change in the makeup of migrants attempting to cross into the United States from mostly single adults to children and families traveling together. 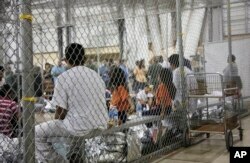 FILE - In this June 17, 2018 file photo provided by U.S. Customs and Border Protection, people who've been taken into custody related to cases of illegal entry into the United States sit in one of the cages at a facility in McAllen, Texas. About 40 percent of those apprehended in fiscal 2017 and 2018 were unaccompanied children or families with children, compared with 10 percent in 2012, according to the Migration Policy Institute, a non-partisan think tank. According to numbers released Tuesday, U.S. border officials arrested nearly 397,000 people in total at the southern border in the 2018 fiscal year that ended Sept. 30, a significant increase over the 304,000 apprehended in 2017 but largely in line with arrest trends of migrants at the U.S. southern border over the past decade. Experts believe that Trump's anti-immigrant rhetoric dissuaded potential migrants from crossing in the first months of his presidency. Trump has vowed to begin cutting millions of dollars in aid to Central America over a caravan of thousands of mostly Honduran migrants fleeing violence and poverty at home. He has called the caravan, which is currently in southern Mexico, a national emergency as he seeks to boost his Republican Party's chances of maintaining control of Congress in the Nov. 6 elections. FILE - A Honduran migrant caravan heads to the U.S., on the Guatemala-Mexico international border bridge in Ciudad Hidalgo, Chiapas state, Mexico, Oct. 20, 2018. Earlier this year, Trump's administration tried to deter families from traveling to the border by instituting a "zero tolerance" policy, separating thousands of children as their parents were prosecuted. About 2,500 children and parents were separated before Trump abandoned the policy in June after a public outcry. A federal judge ordered the families reunited, a process that is still incomplete. 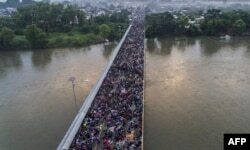 In Texas' Rio Grande Valley (RGV), where more migrants are arrested crossing illegally than in any other section of the 2,000-mile-long (3,200-km) border with Mexico, apprehensions continued to rise in October, said the Border Patrol sector's Chief Patrol Agent Manuel Padilla. RGV made over 12,700 arrests in the first three weeks of October, marking a 112 percent increase over the same period of 2017, Padilla said in a phone interview. Sixty-four percent of those detentions were of family members or unaccompanied children from countries other than Mexico, up from a rate of 51 percent in all of fiscal year 2018, Padilla said. Over 5,400 family units were detained in the first half of October, up 300 percent from the same period of 2017. "Right now we're at maximum capacity when it comes to detention, and so is ICE [U.S. Immigration and Customs Enforcement]. Our detention capacity is just breaking at the seams," said Padilla, predicting border-wide family apprehensions would rise again in October. "This is not sustainable."